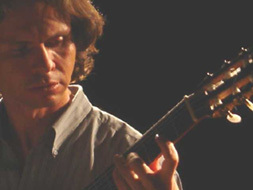 Guitarist, arranger and composer, born in Brasília, graduated in Guitar and Music at the University of Brasilia/UnB and got a Masters at the Federal University of Goias/UFG. Working as a musician and researcher, he has been standing out in the musical scenario. Besides of being a member of Alma Brasileira Trio, he is a professor at the Escola de Música de Brasília (Music School of Brasilia), CD/DVD producer and composes soundtracks for TV and video.